People generally tend to only discuss about all their great hands while playing hold’em and they avoid talking of the mistakes they make. That is only because it is much more fun to talk about your wins rather than your mistakes. Avoiding some mistakes in hold’em would help you make a lot more profit rather than just winning a few hands every now and then. Here are a few common mistakes people often make while playing hold’em. The first mistake that most beginners make is playing far too many cards. They would play on low connecting cards like 5-6 and suited cards in hopes of making a good hand later. Waiting for a straight or a flush is not a good idea because the chances of making one aren’t too good. Only less than 10% people would make a flush or a straight. So if you keep playing all your hands just waiting for a flush or a straight you would be loosing a lot of money in the long run. 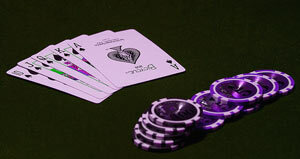 Once players know which starting hands they should be playing they still misplay their hands once they see the flop. They make the decision assuming that they would see the turn and the river cards which would again mean that they would have to go through an extra betting round. Look at each card separately and decide what you want to do. If you do not have a great looking hand on the flop, fold right there rather than wasting any more money to go through the other rounds. At times you will come across tables where you would be making a lot of money and it would seem that you are the best player there. And in other situations you would keep on loosing money feeling as if you are worst than the rest of the players. Luck has nothing to do with this. On some tables you would be playing against players who would be weaker than you and in other situations you might be up against some really good players. You don’t make money just on the basis of your skill level. The best way to make money is to play against the bad players since they would be the ones to make a lot of mistakes and when they do that you would be able to win a lot of money off them.